Wired Design just unveiled a new set of images that provide a detailed look inside Apple's upcoming spaceship-shaped Headquarters in Cupertino. The extravagant office building was first envisioned by Steve Jobs, who personally sought approval for it prior to his death in 2011. 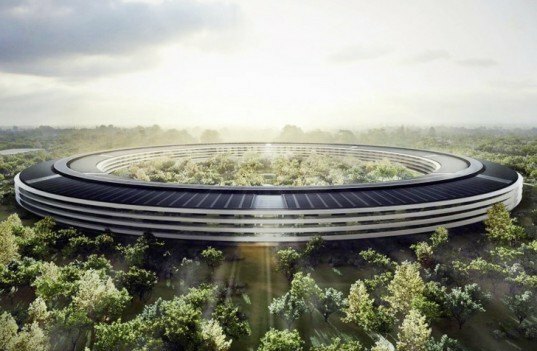 Designed by Foster + Partners, the $5 billion building, which Apple calls “the best office building in the world,” is slated for completion in 2016. Click over to Wired to see all of the new images! The “spaceship” will cover 2.8 million square feet and host up to 14,000 employees. Roughly 260,000 square meters of office space, corporate fitness facilities, auditoriums and cafeterias that will handle lunch for 3,000 employees will be enveloped in pricey floor-to-ceiling panes of concave glass from Germany. A 600-seat restaurant surrounded by over 6,000 trees will boast floor-to-ceiling glass sliding doors. Since the first design was unveiled, the project’s estimated price has shot up from an initial $3 billion to $5 billion. 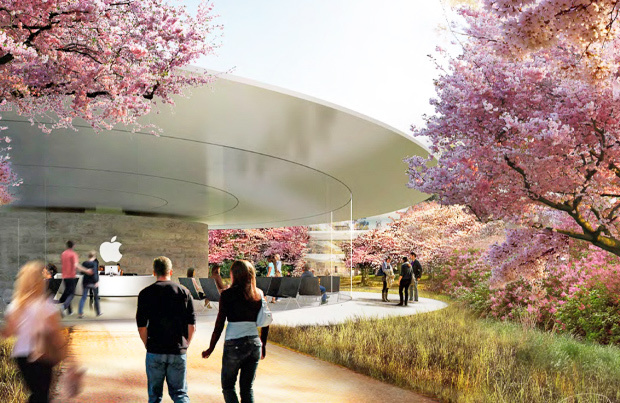 Apple began tearing down 26 buildings on the existing site in June. These excavations expected to last six months will require a 24-hour convoy of trucks, according a former Apple manager. The project has gone through a series of modifications, but models of the latest version can be seen at MercuryNews.com. The “spaceship” will cover 2.8 million square feet and host up to 14,000 employees. A 600-seat restaurant surrounded by over 6,000 trees will boast floor-to-ceiling glass sliding doors. Apple began tearing down 26 buildings on the existing site in June. These excavations expected to last six months will require a 24-hour convoy of trucks, according a former Apple manager. Since the first design was unveiled, the project’s estimated price has shot up from an initial $3 billion to $5 billion. The “spaceship” will cover 2.8 million square feet, and host up to 14,000 employees. Roughly 260,000 square meters of office spaces, corporate fitness facilities, auditoriums and cafeterias that will handle lunch for 3,000 employees. It will be enveloped in pricey floor-to-ceiling panes of concave glass from Germany. A 600-seat restaurant will have floor-to-ceiling glass sliding doors and will be surrounded by over 6000 trees. Since the first design has been unveiled, the project’s estimated price went up from the initial $3 billion to $5 billion. Roughly 260,000 square meters of office space, corporate fitness facilities, auditoriums and cafeterias that will handle lunch for 3,000 employees will be enveloped in pricey floor-to-ceiling panes of concave glass from Germany.